Most of the year he lives near Rome. He is a well-respected scholar, Fellow of the University of Toronto’s Chair of Ukrainian Studies, and the Ukrainian Catholic Eparchy of Edmonton’s and indeed the global Ukrainian Catholic Church’s, expert historian, with the Vatican’s mountain of information at his fingertips. He is Rev. Dr. Athanasius McVay. 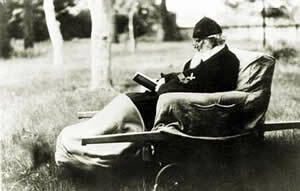 Father Athanasius McVay, author of upcoming book about Metropolitan Andrey Sheptytsky. Father Athanasius is a priest and an historian, focused on researching documents relating to the “Vatican’s twentieth-century diplomacy and the Ukrainian Greek-Catholic Church in the 19th and 20th centuries.” He has written and edited two books, the most recent being his 2014 God’s Martyr History’s Witness: Blessed Nykyta Budka, First Ukrainian Catholic Bishop of Canada, published by the Ukrainian Catholic Eparchy of Edmonton and the Metropolitan Andrey Sheptytsky Institute. After obtaining the privilege of accessing additional Vatican documents, Father Athanasius is completing a book, based on new information he has uncovered about little-known details of the life and activities of Metropolitan Andrey Sheptytsky. What he found through his research has convinced Father Athanasius that, not just the Ukrainian Catholic communities in Canada and Ukraine, but the whole world, regardless of religious, political or ethnic affiliation needs to know and understand this amazing man, his exploits and remarkable impact on his Ukrainian Greek Catholic flock, and the Ukrainian Greek Catholic Church and its place in the world. 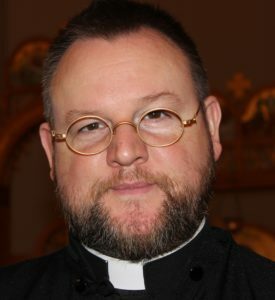 Ordained priest in 1995, in Winnipeg, fluent in four languages, with a working knowledge of four more, Father Athanasius has a doctorate in ecclesiastical history from Rome’s Pontifical Gregorian University, among much other study and certification. He has dozens of professional paper and presentation credits to his name. Father Athanasius is originally from Winnipeg, Manitoba. His father is a native of Newcastle-upon-Tyne, England, and his mother a second-generation Ukrainian-Canadian. In the late 1990s, he administered St. Basil’s Ukrainian Catholic Church in Edmonton. He now spends the greater part of the year immersed in the Vatican and other archives. The high religious seasons – Christmas and Easter – he spends in London, England, assisting at the Ukrainian Catholic Cathedral of the Holy Family. Why another book about Metropolitan Andrey Sheptytsky? There have been scores of works devoted to bringing out specific areas of the Metropolitan’s interests, activities and achievements. English-language books include the 1989 Morality and Reality: The Life and Times of Andrei Sheptyts’kyi edited by Paul. R. Magocsi, Andrew Krawchuk’s 1997 book reflected on Christian Social Ethics in Ukraine: The Legacy of Andrei Sheptytsky, while Fr. 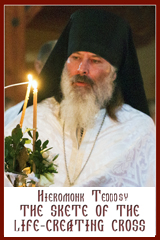 Peter Galadza’s 2004 work entitled The Theology and Liturgical Work of Andrei Sheptytsky (1865-1944) focused on the Metropolitan’s contributions to liturgical practices. When there are many works in existence, why is Father Athanasius, with the encouragement of Bishop David Motiuk of the Ukrainian Catholic Eparchy of Edmonton, so anxious to write a book about Metropolitan Andrey Sheptytsky? In his research into the Apostolic See’s archives, Father Athanasius has uncovered considerable previously unavailable information about the Metropolitan and his work. The Metropolitan was a man for all seasons and for the universal church about whom information should be shared in the universal English language with the entire world. What information was previously accessible and sharable was conveyed in languages other than English. It is Father Athanasius’ belief that the Metropolitan was a man for all seasons and for the Universal Church, about whom information should be shared in the universal English language with the entire world. In 1985, St. John Paul II permitted scholars to access materials up to the year 1922. “In 1997, on orders of Pope St. John Paul II, the Oriental Congregation specifically opened Eastern Catholic documents pertaining to martyrdom of the Eastern Churches,” Father Athanasius explains. 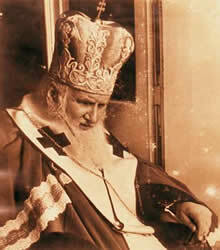 In 2006, Pope Benedict XVI opened those from 1922 – 1939 for consultation by historians, among them Father Athanasius, one of the very few representative from the Ukrainian Catholic Church. These archives are referred to as the Vatican Secret Archives. Unfortunately, Father Athanasius notes, “the terminology suggests a rather sinister meaning.” What the name is intended to convey is simply that these documents are private material belonging to the Apostolic See. What has become clear in his research into the pertinent documents, Father Athanasius indicates, is that Metropolitan Andrey held a state office in the Austro-Hungarian Empire, in addition to managing his religious responsibility. Metropolitan Sheptytsky’s sole purpose was the “Cause of the Union,” unity, identity, Liturgy belonging to the Kyivan Church rather than a hybrid. This goal of a vselenska tserkva (universal church) became an obstacle to unity with the Orthodox. “He was accused of playing politics,” says Father Athanasius, to bring about a united Ukrainian voice. 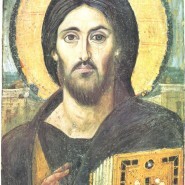 He wanted recognition that Eastern Churches have the same dignity as the Latin Church. When Poland dominated the scene, many Ukrainians were forced to convert to the Roman Rite. The old Polish-Lithuanian Commonwealth looked at things from the social order/class perspective rather than based on ethnic lines. Because of the Sheptytsky family’s standing, the Polish saw the Metropolitan as part of their elite and expected him to take his people’s (the Polish) side rather than that of his Ukrainian flock’s. Because he was intent on strengthening the Ukrainian Catholic community’s position, he was seen by the Polish as a traitor because he supported an independent Ukrainian state. According to the research Father Athanasius has been able to complete, Metropolitan Andrey “was a diplomat who tried everything to bring about his goal.” He was misunderstood at times and criticized for his letters to the likes of Tsar Nicholas II, Stalin and Hitler in an effort to protect the Ukrainian position. His pleas to the Vatican often went unanswered. His goal was unity of the Church and fidelity to Christ. The Metropolitan Andrey Sheptytsky story will be an ongoing, evergreen project as more and more documents become available and more information is unearthed, Father Athanasius believes. Currently, most of the Vatican files from 1939-1944, covering life under the Soviet and Nazi regimes are still closed. Nevertheless, he was granted a special privilege of accessing those at the Congregation for the Eastern Churches, because of the exception made by St. John-Paul II in 1997. The new information will be of interest to people of many backgrounds not just to scholars and clergy. Stories such as those that illustrated Metropolitan Sheptytsky’s humanitarianism, not only for his own flock, but for others will provide a valuable insight into the leadership of the Ukrainian Greek Catholic Church in the 1930s and 1940s. “Before the end of 1945, Pius XII had immortalized the late Metropolitan within an act of the papal magisterium, the encyclical letter, Orientales omnes ecclesias,” writes Father Athanasius in his upcoming book. “The letter praises Sheptytsky [for] his long episcopacy and achievements, singling out the Theological Academy and other institutions of learning and culture. The second paragraph speaks of Kyr Andrey in the context of the persecution of the Greek-Catholic Church. Father Athanasius hopes that his book will bring to light the information that has now become available about the religious hot topics that challenged Metropolitan Sheptytsky and expand the needed historical background about this remarkable man in the turbulent times of the 1930s and 1940s. 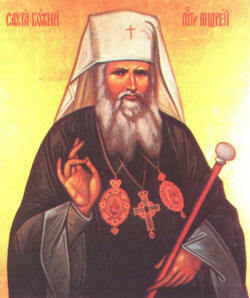 Metropolitan Sheptytsky died in 1944. Publication of the book is slated for 2018.
is the Canadian-based Ukrainian Jewish Encounter video posted at https://ukrainianjewishencounter.org/en/saved-by-sheptytsky/ with very touching testimony from several of those whom Metropolitan Sheptytsky saved from annihilation by the Nazis. His cause with the Yad Vasham organization’s recognition as Righteous of the Nations is being promoted by such key individuals from the Jewish community as the current chief-Rabbi of Ukraine, Rabbi Dov Bleich, “former Polish Foreign Minister Adam Daniel Rotfeld, Nobel prize-winning chemist Roald Hoffmann, David Kahane, the former chief rabbi of the Israeli Air Force, and the pediatric cardiologist [Dr.] Leon Chameides,” according to Vladislav Davidzon in a Tablet Magazine article.